I am now just in from the mall and a quick trip to the Bath and Body Works store... I know.. no surprise there. It is kind of expected that when you go to the mall, you stop in whether you need anything or not. And I really don't but I am nosey and wanted to see what if anything is new. The manager greeted me by name, as always, and we exchanged pleasantries and she then asked what don't I have. Not much I answered her and she said that there was nothing new in her back room now until the November 4th release of items.... 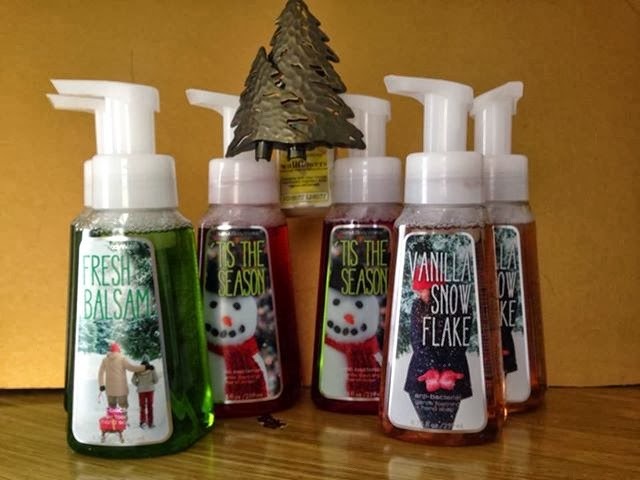 But her store was one that is having a buy three get three free sale not only on the signature items but the HAND SOAP too. With close to ...well... a lot of hand soaps already in my inventory...and a list of the other new ones coming I want...I didn't need soap...but these snow day line of foamies will make good add to's for the gift baskets so I grabbed six of those and got a light up double tree wallflower as my free item. Seven items for $17.49 total. Not too bad.